Rembrandt’s apparently substantial interest in things Jewish has been matched by western culture’s interest in Rembrandt’s interest in things Jewish. This has led to a range of misconceptions over the last century and a half: for example, he was Jewish (he wasn’t), or that he sought out Jewish models because they had individuality and character (many of the pieces that seem so particular were probably “tronies,” generalized images of familiar character types). Abby Schwartz, Director of the Skirball Museum at Hebrew Union College, describes the time in the art fandom when all the old men with beards in Rembrandt’s paintings were called Jews and all old men with hats were called rabbis. It is actually hard to tell what Rembrandt intends to be a representation of a Jew. 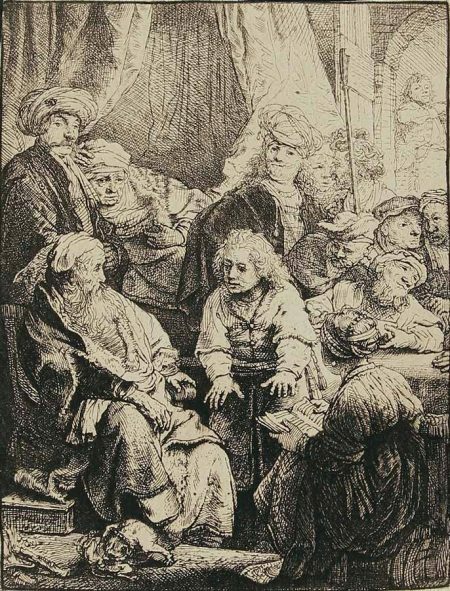 The etching used on the publicity mailing for the exhibit is Rembrandt’s etching currently titled “Jews in the Synagogue (Pharisees in the Temple)” (1648), which in fact may or may not represent Jews who may or may not be in a temple. The two etchings known colloquially as “The Jewish Bride” are both thought nowadays by scholars to depict Rembrandt’s wife Saskia, one striking a pose as Queen Esther (1635), and the other showing her represented as St. Catherine. As far as the actual Jews Rembrandt might have encountered in mid-seventeenth century Amsterdam, the story is complicated. Lisa DeBoer, the original Curator of the show, which features prints from the collection of Dr. Howard and Fran Berger owned now by the Westmont Ridley-Tree Museum of Art, has written an excellent catalogue essay on the question, which takes us into the changing populations of the neighborhood in which Rembrandt lived and worked. During the early part of his career, the Jews Rembrandt would have known belonged to a small but wealthy and well-educated group of Sephardim, refugees from Spain and its Inquisition and subsequent repressions. We know that at least four of these Sephardic Jews were patrons of Rembrandt. Later in his career, the neighborhood shifted and became dominated by Ashkenazim, a group both larger and more rapidly growing, who were less wealthy, less well educated, and generally more visually exotic. It seems likely that while the imaginary Jews imputed to Rembrandt’s paintings came from the latter group, his actual dealings were more with the former, who were well assimilated into Dutch culture. When they appear in Rembrandt’s portraits, like the etching identified as Rabbi Menasseh ben Israel, they may in fact be images of other well-to-do thoughtful Amsterdam citizens. 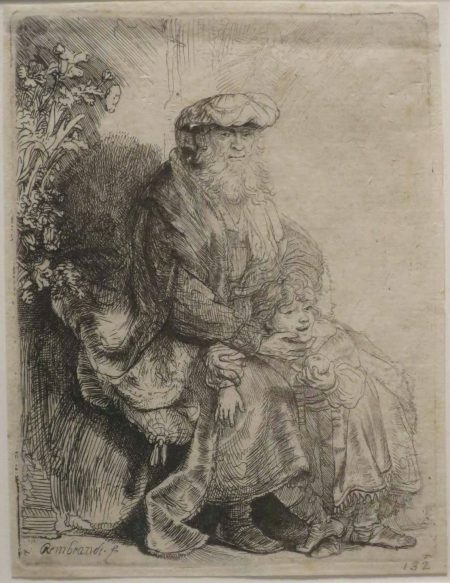 What this small show of some twenty etchings—mostly in particularly excellent strikings from generally early pullings—makes clear is that Rembrandt was seriously interested in the Old Testament. It is interesting to imagine what a companion show to this one, of Rembrandt’s etchings from the New Testament, might have looked like. Throughout the course of Rembrandt’s boom and bust career, he kept returning to Old Testament characters and stories. In them, he found a source of authority (perhaps because, among other reasons, Old Testament characters dealt directly with heavenly beings and edicts), a source of prefiguration (in which Old Testament episodes seem to both predict and confirm New Testament ones), and a source of stories and characters who embody spirituality, conflicting desires, and the nature of faith. And what caught Rembrandt’s imagination when he thought about the Old Testament? It’s interesting what’s not there. There are no prints from the Book of Exodus—Rembrandt’s Old Testament is not Mosaic—no pictures of prophets, no images of violence, wars, or slaughter. Though Rembrandt produced a great and highly idiosyncratic version of Adam and Eve, that’s not included in the show, presumably because the Bergers reasoned that there were no Jews until Abraham. On the other hand, there are more prints featuring Abraham than any other figure (plus additional ones of his successors Isaac and Jacob), two of David, two from the world of Esther, and two from the Book of Tobit, which has sometimes been considered canonical and sometimes apocryphal. Rembrandt seems to have been particularly drawn to Old Testament stories where divine behests led to family conflicts, something Rembrandt loved to dramatize. In the tiny etching “Joseph Telling His Dreams” (1638), a very young Joseph earnestly tells his father Jacob, stepmother, sister, and multiple older brothers about his dream in which he, the youngest, will eventually receive homage from all the rest of them. This print is a good example of the ways in which the Old Testament might be envisioned as prefiguring the New, as this scene resembles pictures of Christ among the Doctors. Joseph’s stepmother, Leah, seems rapt, his sister Dinah, is attentive, and most of the others show various degrees of irritation, astonishment, anxiety, and mockery. Joseph leans in; his father leans back: this is not the Jacob who will weep uncontrollably at the sight of the blood-soaked coat of many colors that will subsequently be presented to him by the scheming brothers. Only his stepmother and sister fully appreciate the seriousness of the dream, which is the point of origin of all the rest of the Joseph saga, since it will lead directly to his being sold into slavery in Egypt. Joseph is incredibly earnest while he describes his ascension and their submission and absorbed in recounting his symbolic dream—so much so that he can’t realize what his audience is making of his pronouncements. I would say that much of Rembrandt’s interest in the Old Testament family drama goes something like this. It is rootedly intergenerational. It finds its core in stories of fathers sacrificing their sons. From the perspective of the sons, the father will betray them in unspeakable ways. Fathers may do this for the greater good, or they may try to undo, successfully or not, what they have done, but so often from the son’s perspective, there is that looming sacrifice, and the need for dreadful obedience. After the sacrifice, the focus shifts to the father. He becomes older and more and more alone, even when in company. But eventually, the father will find new occasions for faith, which might even include the possibility of reconciliation. This is how Rembrandt envisions the story of Abraham. There is the well-known etching of “Abraham’s Sacrifice” (1655), one of the greatest of his baroque chiaroscuro dramas. Abraham and Isaac are both literally stripped down. The father has put a hand over his son’s eyes as he stretches out his arm with the deadly knife just as the angel intervenes. Covering his eyes may have been a merciful gesture, but it takes away individuality and agency from Isaac. Isaac must literally put his blind faith in his father and his father’s God. 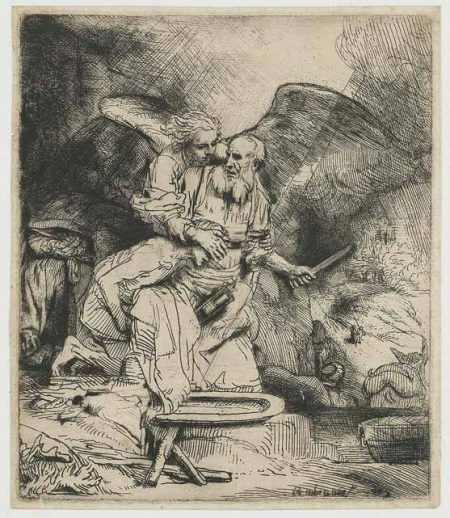 With a face as young as his son’s must be, the angel stops Abraham by wrapping his arms around the arms of the older man. Distraught and determined, the father—whose expression is partly obscured from us because his eyes have been darkened in—seems taken aback at the possibility of divine mercy. He seems to be shocked; perhaps he feels relief at the end of an immense exertion. He certainly isn’t feeling joy. Even more psychologically remarkable is the etching “Abraham and Isaac” from a decade earlier (1645). Here, Abraham—with one hand on his heart and one hand pointing up—is the dutiful servant of the Lord doing some patriarch-‘splaining to his young son, presumably telling him about his murderous decision and promise. The drama of this print is all in Isaac’s understated expression, neither confronting his father nor looking quite away, but taking in the awfulness of the situation. Equally complex is “Abraham Casting Out Hagar and Ishmael” (1637), in which the patriarch banishes the child he has had with his wife’s servant along with the mother. 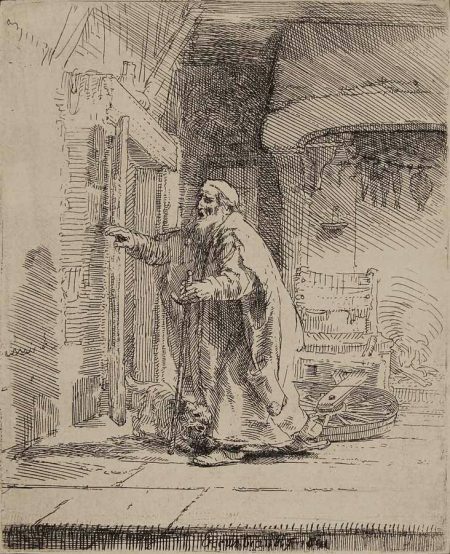 This is one of many prints with an explicitly domestic setting; a lot of Rembrandt’s visions of Old Testament stories are rife with doors and windows, of insides and outsides. Abraham must purify his household by purging it of those not covered by the covenant; his quietly gleeful wife Sarah is all for it. But it is hard to tell where Abraham’s heart is, as he makes eye contact with none of the other figures and gazes out into the distance where Ishmael and his mother must go. While Hagar is visibly weeping, Rembrandt doesn’t let us see anything of Ishmael’s face. What must he be thinking of his father’s cruelty? As with Isaac in the 1655 print, the sacrificed child keeps his own counsel. “The Return of the Prodigal Son,” done one year earlier (1636), can be read as the opposite of “Abraham Casting Out Hagar and Ishmael”; they are, in some ways, bookends of the same story. (It is interesting that the Bergers—and the Curator—decided to include this print in the collection and the exhibition, as it is plainly a New Testament story.) In his abject misery—the returning son here barely looks human—the prodigal throws himself at his father’s feet, and his father rushes to forgive him and accept him back from banishment. There is no fatted calf that I can find in the etching, but his father is rapidly arranging to clothe his son’s nakedness. The father leans down to embrace him, at least as moved by the prospect of a second chance as the son is. It seems the vibrant story of how the old and the young share the opportunity to reinvigorate each other, and probably had a great deal of resonance with other 17th century narratives of forgiveness and new starts for people of faith and exiles. The exhibition is arranged in HUC’s small but elegant gallery in chronological order, but the chronology is that of the order of our encountering these Biblical figures while progressing through the Old Testament, starting with Abraham and ending with Tobit. 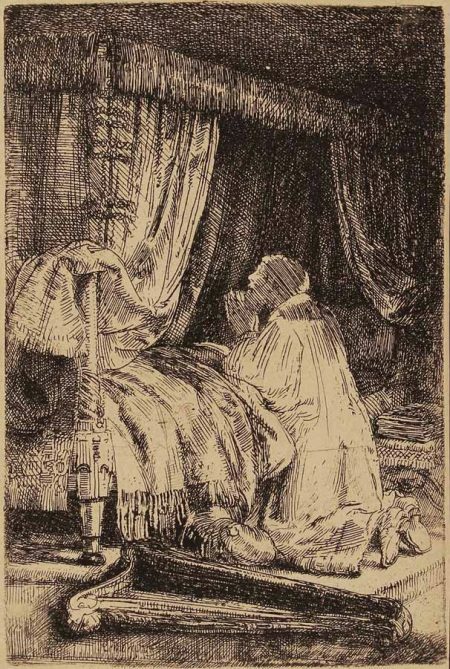 I felt that there was another chronological story that these prints told, focusing on the changes in Rembrandt’s style, sensibilities, and ideas about faith as he moved from the 1630s through to the 1650s. Stylistically, in the 1630s, there are finer lines and more white spaces. This enables the psychological insight we gain when we see people’s eyes. 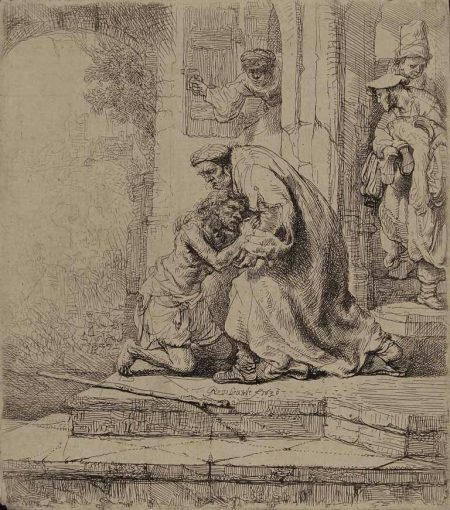 In the print now called “Jacob Caressing Benjamin” (1637), which used to be given the even more highly charged title of “Abraham Caressing Isaac,” an old man is holding a squirming, playful child. (What a horrible thought that this might be the delightful child the loving father must sacrifice. Who would willingly harm such a creature—besides Abraham?) The father has a thoughtful if distant smile, and is looking almost directly at us. The dramas of faith are social, inclusive, even crowded. Faith is represented by people’s relationship to others. In the works of the 1650s, the intaglio of the etchings tends to be deeper, causing the lines to be thicker and blacker. Drama is everywhere. The darkness that surrounds the figures is echoed by a darkness within; the eyes of the main characters are averted or in shadow, and their expressions are elusive and mysterious. Above all, the figures in these later prints tend to be more solitary. Their faith is in relation to themselves. They are not so much torn as they are haunted, but are determined to find occasion to demonstrate their faith on their own. “David in Prayer” (1652) shows the king in a private moment. Kneeling on a pillow, a lanky old man says his prayers into the dark, empty space above his bed. His harp lies on the floor, as if discarded. We see him in profile, his face showing very few features. His eyes might be closed. This is a grown man who must, in his prayers, define himself without a youth to serve as foil, or object of love, or potential sacrifice. He has set his life aside to pray, perhaps for guidance, perhaps for forgiveness. It is interesting to pair this with “The Blindness of Tobit: The Larger Plate” (1651). Tobit is as active as David was still. Expecting the long-awaited return of his son Tobias, a blind old man has abruptly stood up out of his chair near the fireplace, knocking over a spinning wheel in his eagerness. Trying to answer the opened door but pointed in the wrong direction, he looks about to walk straight into his own shadow on the wall. The image is as light as David’s was dark, though it hardly matters to Tobit; in his blindness, he is the perfect vehicle for the image of a man whose eyes are opaque to us. His situation is perilous; there is a step in the foreground that he can’t see. His son isn’t yet in the picture to greet or guide him. His wife is somewhere around, but not visible to him or us. His blindness will in fact be healed, but not yet. For now Tobit is alone and knows none of those things. Still he strides, showing no hesitation, right towards the wall. That’s faith. The show is not sentimental about Rembrandt and the Jews. It pulls back from the biographical, as the evidence for the most part requires. It shows Rembrandt as an artist interested in faith that does not come cheaply, and suggests that even the grandest of spiritual dramas can be found to have been played out in the domestic realm with actors neither greater nor lesser than fathers and sons, old men and young ones. The Skirball Museum is open on Tuesdays and Thursdays from 11 a.m. until 4 p.m., and on Sundays from 1 p.m. until 5.